Commentary from a Boston crank. 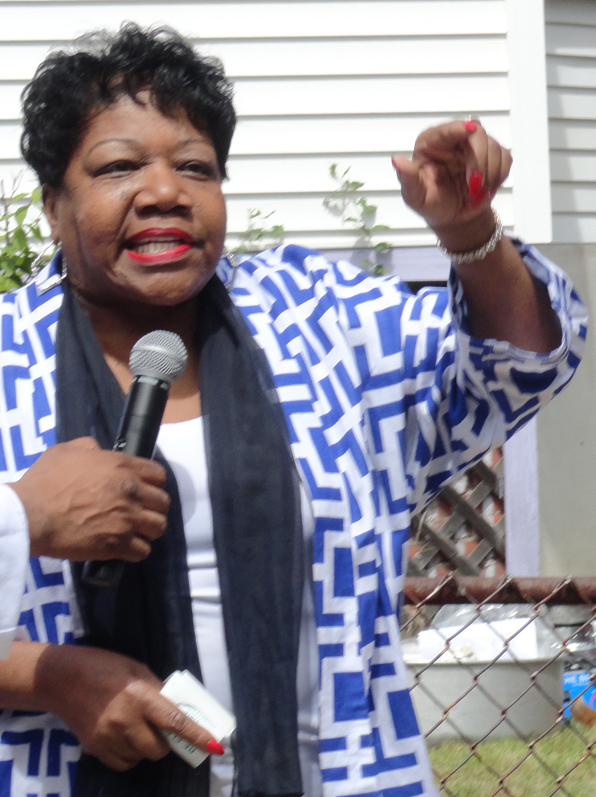 If you’re running for office in Boston or statewide, you’re smart to show for City Councilor Tito Jackson’s annual turkey fry. Most gubernatorial contenders showed, among others, for this sixth version. For you left-brain types and other quibblers, yes, there’s a lot more than turkey, like burgers, dogs, BBQ, a few non-meat offerings, sodas and water (no alcohol), ice cream and ta da, a snow-cone machine. Oh, and while Tito is a big guy, he had four loudspeakers in the street, each of which was bigger than he. The music kept people dancing, swaying, eating to the beat, and shouting to be heard. Sweet. 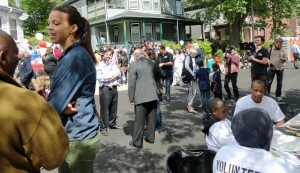 Mostly, this is a street party for the Roxbury neighborhood above Seaver Street. Plus the pols get to mingle while they and their minions pitch planks and promises. There are surprisingly few events so casual and low-key where pols can have several easy hours chatting up black and Latino voters outside a dais/chair venue. I tried to behave well, not dominating time with pols nor even taking pix of all of them. Many have been guests on my Left Ahead show. I’d already met nearly all of them and it was a chance to touch hands again. In some cases, we swapped cards and agreed the candidate should come on the show or come on again. Pix clix: Click a thumbnail for a larger view. If it opens in the same window, use your browser’s back button or command to return. License note: All pix are Creative Commons-Attribution. Do what you want with them. Just give Mike Ball credit once. Another familiar face and voice was Felix D. Arroyo, former Councilor, father of a current councilor, and candidate for register of probate and family court. He’s always delightful and to us boomers sounds refreshingly like Ricky Ricardo. 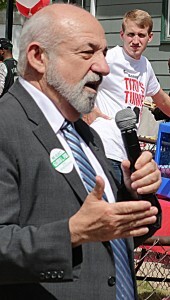 In fact, he noted that when he first ran for office many years ago, his accent was stronger.He asked one thing of the voters before him, on the Sept. 9th primary, his office will be down at the bottom of a long ballot, he wants to make sure people get all the way down there and finish the job. Not everything was smiles and sandwiches. 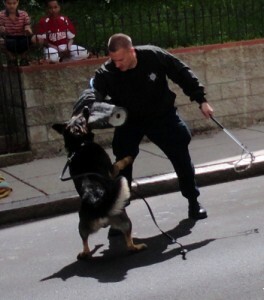 The Suffolk sheriff crew showed up with a police-dog demo. Adults a bit, but mostly the kids were impressed at the tenaciousness and training. 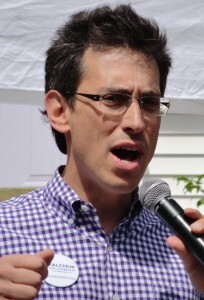 Evan Falchuk (governor on the United Independent Party and sure to be on the November ballot) noted both in his remarks and to me that he considers it his job to discomfort the other candidates and raise key issues. In a deep nod to the Roxbury locale, he said that carried over, not so much to where the party was but to where he lives (Newton). He noted that his daughter and her classmates didn’t get the BPS-style warnings about how to behave when confronted by police. He said he regularly draws attention to the contradiction with urban communities of color. 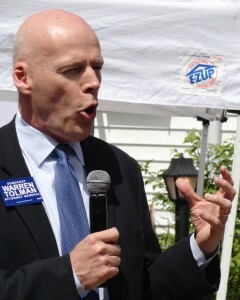 Warren Tolman (lAG) pitched specific planks, like support for smart-gun technology. 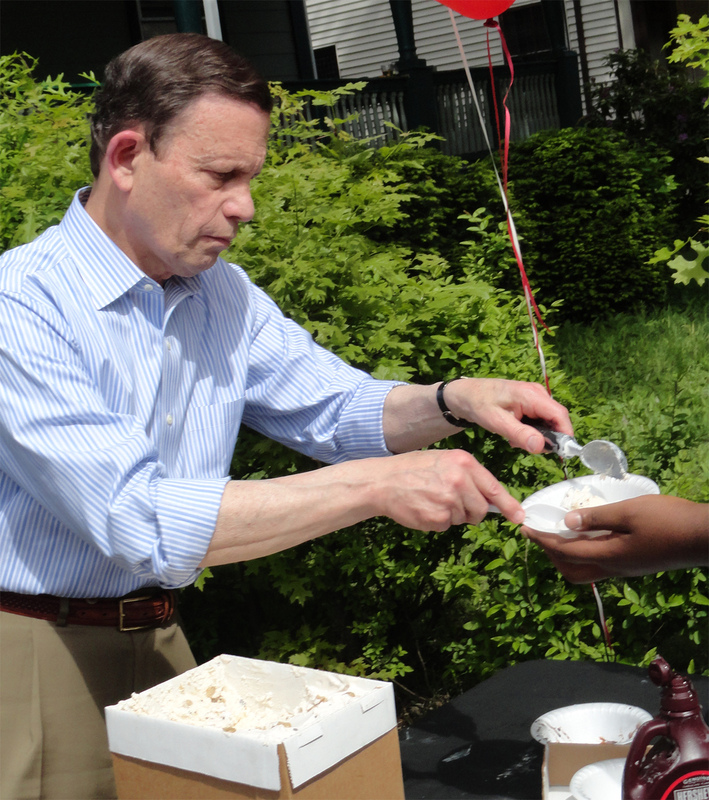 In a turnabout that borders on irony, gubernatorial candidate Steve Grossman immediately went to the ice cream table — but to server rather than eat. He loves ice cream but is willing to share.By the bye, he said he wasn’t disturbed ty the recent poll that showed rival Coakley well ahead of all contenders. He noted his campaign had not spent a dime on ads and when it started, the field would level. Moreover, the thought the poll was an outlier. General and specific personal musings and rants. See my other sites for the politics. © 2019 Harrumph! · Proudly powered by WordPress & Green Park 2 by Cordobo.